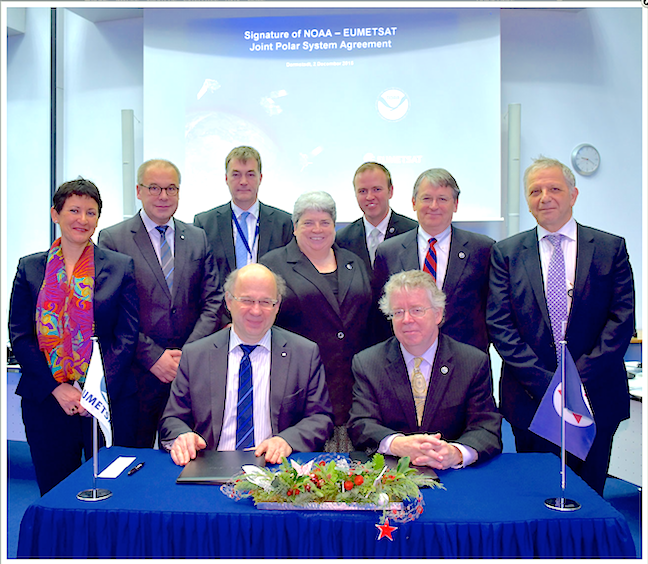 EUMETSAT and the National Oceanic and Atmospheric Administration (NOAA) of the United States signed an agreement on their Joint Polar System (JPS), which will provide observations from two complementary polar orbits in the period from 2020 to 2040. This JPS Agreement was foreseen by the Agreement on Long Term Cooperation signed on August 27, 2013 and extends to a new generation of polar-orbiting satellites the cooperation established since 1998 on the Initial Joint Polar System which builds on EUMETSAT’s Metop and NOAA’s POES and Suomi-NPP satellites. Under the new Agreement signed today by Stephen Volz, NOAA Assistant Administrator for Satellite and Information Services, and Alain Ratier, Director-General of EUMETSAT, both organizations will establish and operate a Joint Polar System composed of EUMETSAT’s Metop-Second Generation (Metop-SG) satellites, NOAA’s JPSS satellites and shared ground systems and services. Joint operations will include cross support for data acquisition and spacecraft monitoring through European and US ground stations located in Svalbard, Spitzbergen, and McMurdo, Antarctica. The Metop-SG and JPSS satellites will continue to respectively cover the mid-morning and the afternoon orbits to provide more frequent global coverage for a broader range of observations of weather, atmospheric composition, ocean and land surfaces. Polar-orbiting meteorological satellites provide the most important observational inputs to the numerical weather prediction (NWP) models used for up to 10 days. Today, the observations from the Initial Joint Polar System account for nearly 50 percent of the contributions of all observations to the reduction of errors in numerical forecasts for day one, and further improvements to forecasts are expected from the enhanced observation capabilities of the JPS satellites. Stephen Volz said, “Today’s agreement means our [NOAA and European] forecasters can rely on improved satellite data to predict and track storms and monitor the global environment from space for years to come.” He added, “Our successful partnership with EUMETSAT demonstrates why international collaboration and full, free, and open data sharing are essential to meeting NOAA's commitment to protecting lives and property in the United States."